The Brihattar Zoo-Narengi Anchalik Unnayan Samiti and the Zoo-Narengi Tiniali Byabashai Santhaon Wednesdayjointly organised a public meeting in protest against the Bharatiya Janata Party-led Central Government’s move to grant Indian citizenship to illegal migrants including Hindu Bangladeshsi by implementing the Citizenship (Amendment) Bill, 2016. “A section of people have taken advantage of the Government’s silence. If this silence of the Government creates problem in the State in future, then the Government would be responsible for that,” Gogoi said. Meanwhile, senior journalist Adip Kumar Phukan alleged the Central Government has moved to implement the Citizenship (Amendment) Bill, 2016 following instructions from the Rashtriya Swayamsevak Sangh (RSS). 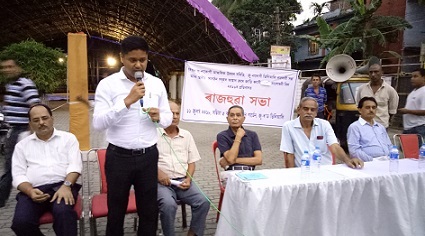 People of the locality also attended the meeting held at Brindaban Garden, Zoo Road Tiniali in Guwahati.